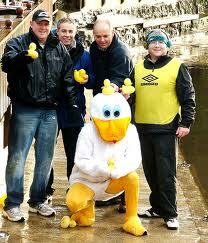 The New Year’s Day Duck race starts at 1.30pm, when the Ducks are launched from High Bridge. They then race to the finish line by Marigolds Cafe. The event raises money for the Club and for Henshaws society for Blind people. Please come along and support this event which kicks off the club’s Bicentenary celebrations. This entry was posted in Juniors, News, Seniors on December 31, 2014 by knaresboroughcc. The best way is to email Andrew Ward. He will have a list of winning numbers. I think all the winners will have been contacted by now.